Don't look now, but there are two craters here! Not only that, but the crater on the left has two rings. Did you find them both? 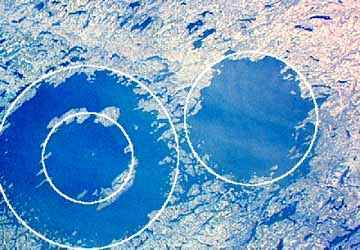 They are the East and West Clearwater Lake craters. Both were made at the same time about 290 million years ago, probably by a double asteroid like Toutatis (see: Asteroids).